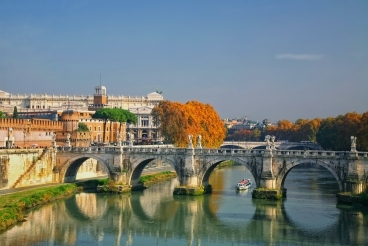 Sant'Angelo Bridge in Rome is one of the oldest pedestrian bridges over the Tiber River. It was built in Roman times. 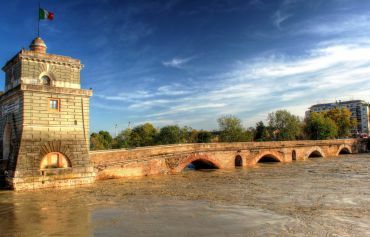 Bridge stretches for 135 meters and is decorated with Baroque statues. 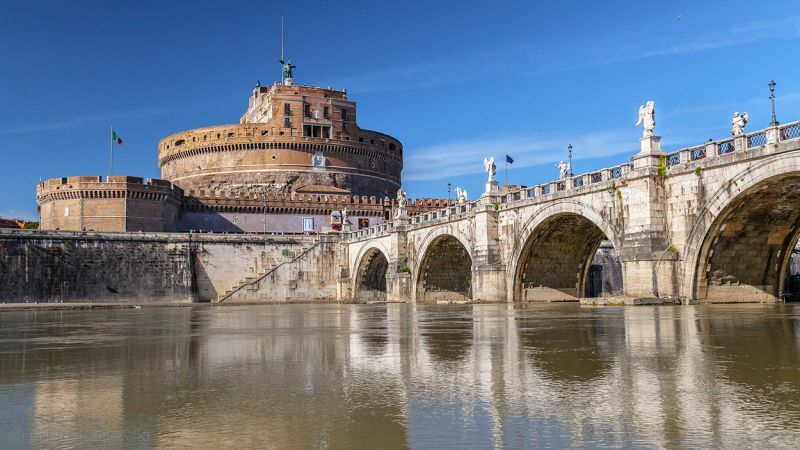 In 134–139 years of this century the Emperor Hadrian has decided to connect his mausoleum (that is better known today as the Castel Sant'Angelo) with the Champ de Mars, and ordered to build a bridge with three arches, and gentle slopes on the sides. In the 19th century after the reconstruction of the embankment, slopes were replaced by two arched structures. Sant'Angelo Bridge in Rome has changed its name several times. 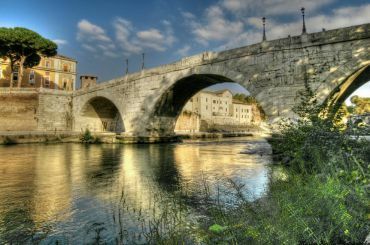 At first it was called Aelian Bridge in honor of the emperor. After the construction of St Peter's Basilica in the 16th century it was used by the pilgrims, and the construction got a new name – the bridge of St Peter. From the 14th century Castel Sant'Angelo, the former mausoleum was used as a prison. Executions were carried out in it, and the bodies of criminals were exhibited on the bridge. 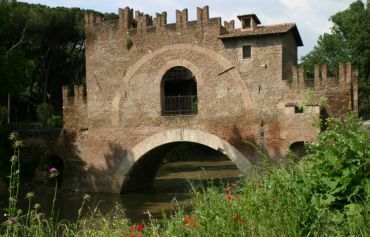 Name of the bridge and the castle is connected with the myth of early Christianity during the period of the reign of the Pope Gregory I and a plague epidemic that raged in Rome. Once pontiff happened to witness the Archangel Michael, standing on the roof of the castle and putting his shiny sword in the sheath. Gregory understood it as a sign of the end of the disease. Soon the disease subsided, and the castle and the bridge were named in honor of St Angelo, who saved Rome from the plague. In the 17th century the Pope Clement IX ordered Bernini, master of Baroque school, to create ornaments for the St Angelo Bridge. Sculptor and his disciples created a new design of the bridge and ten statues of angels, that embodied the Jesus’ passion on the cross. Bernini designed statues in such a way that they can be observed from three angles, bearing in mind that people will pass the bridge in both directions. Thus, in addition to the front view, statues of angels can be seen under an angle of 45 degrees. Two sculptures were made by the master, and the rest – by his disciples. Oblique view was better seen from Rome and was intended for pilgrims. Another view – the front view from the bridge. The third side angle – from the church. 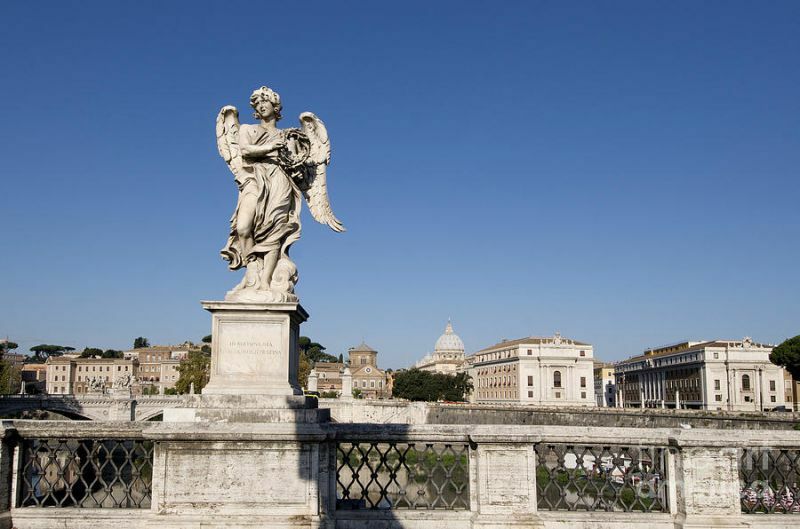 Two statues of angels, made personally by Bernini, were so great that the Pope Clement ordered to put them in the church of Sant'Andrea delle Fratte, and installed the replicas on the bridge. Angel with the Crown of Thorns, Paolo Naldini, with a quote from Psalm 31:4: "I am twisted in my affliction, whilst the thorn is fastened upon." The original made by Lorenzo Bernini is in the church of Sant'Andrea delle Fratte. Angel with the Superscription, Giulio Kartar, with a quote from Psalm 95: "God has reigned from the Tree." The original made by Lorenzo Bernini in the church of Sant'Andrea delle Fratte. Angel with the Column, to which Jesus was attached at the time of the scourging, Antonio Raja with a quotation from Ecclesiasticus 24:4: "my throne is upon a column." Angel with the Whips, Lazzaro Morelli, with a quote from Psalm 37:18: "I am ready for a whip." Angel with the Cross, Ercole Feratta, with a quote from Isaiah 9:6: "whose government shall be upon His shoulder." Angel with the Sponge, Georgeta Antonio, with a quote from Psalm 69:21: "they gave me vinegar to drink." The angel with the Lance, Domenico Guidi, to quote from the Song of Solomon 4:9: "Thou hast ravished my heart." The angel with the Nails, Girolamo Lutsenti, a quote from the book of Zechariah 12:10: "they shall look upon me whom they have pierced." Angel with the Sudarium (Veronica’s Veil), Cosimo Fancelli – a quotation from Psalm 84:9: "look upon the face of thy Christ." Angel with the Garment and Dice, Paolo Naldini – Psalm 22:18: "upon my vesture they cast lots." To the Sant'Angelo bridge in Rome, you can get on the metro line A to Lepanto station or by bus number 62, 40, 23, 271, 982, 280 to the stop Piazza Pia and the number 46, 64 to the stop of Santo Spirito.